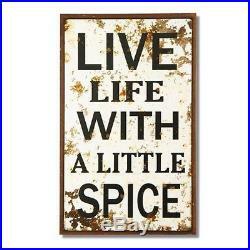 Adeco Decorative Wood Wall Hanging Sign Plaque "Life Live With A Little Spice" Black, Off White Home Decor. Add a splash of color and style to the bedroom, kitchen or front hall with this fun wall sign. 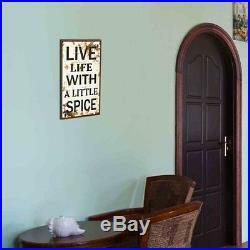 Bold text reads "Live Life With A Little Spice" in block lettering, on an off-white background with a brown border. The plaque has a vintage, rusted effect. This simple plaque complements many decor styles, and makes a wonderful housewarming, wedding or anniversary gift. Dimensions: 10.5x16.6", 0.4" thick. Your return must be in new and unused condition. After this time period, we cannot accept a damaged return. Damaged items will only be exchanged once we receive the damaged item back. Please include your return reason in detail. The item "Adeco Decorative Wood Wall Hanging Sign Plaque Life Live with A Spice Black Off" is in sale since Wednesday, January 18, 2017. This item is in the category "Home & Garden\Home Décor\Plaques & Signs". The seller is "yozos" and is located in Crosby, Texas. This item can be shipped to United States.